The Marea cable will transmit data at 160 terabits per second and stretches from Virginia Beach in the US, to Bilbao in Spain. Microsoft and Facebook have just laid a super-fast 4000-mile (6437-km) internet cable across the Atlantic. When it goes live next year, it will transmit data at 160 terabits per second – enough to stream 71 million high-definition videos at the same time. The cable, called Marea, is only around 1.5 times as thick as a garden hose, but it stretches from Virginia Beach in the US to Bilbao in Spain. Northern Virginia has long served as a major hub for internet data centers. This latest cable connects the US to Europe, and from there to Africa, the Middle East, and even Asia. 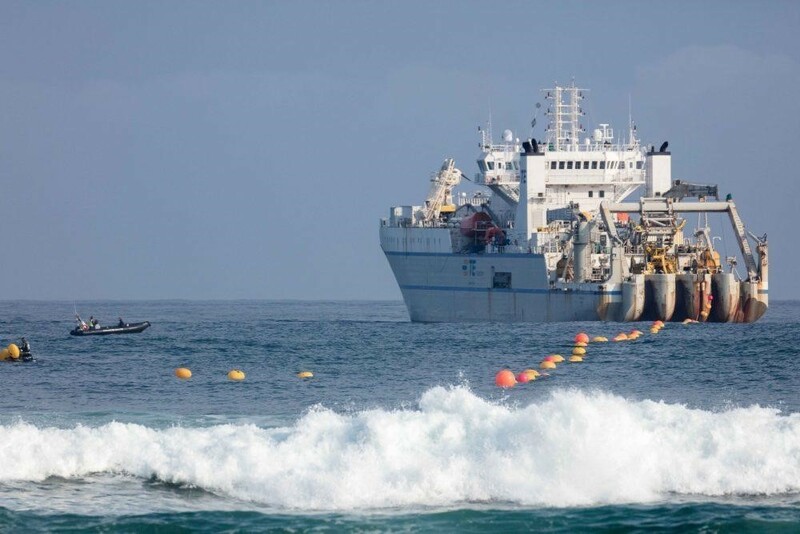 Microsoft says that it is the highest-capacity subsea cable to cross the Atlantic, with speeds more than 16 million times faster than the average home internet connection. Telxius, a subsidiary of telecom provider Telefónica, is the third partner and will manage the construction process and operate the cable. Telxius says the cable will benefit customers, offering internet at lower costs and making equipment upgrades easier. Traditionally, telecommunication companies have been the ones to invest in building submarine cables. However, tech giants like Microsoft, Facebook and Google are increasingly getting in on the act. This is the first time that Facebook has taken an active role in building a cable, rather than investing in existing projects or using other companies’ cables. Last year, Amazon Web Services (AWS) invested in the Hawaiki Submarine Cable to speed up performance for its cloud customers. The Hawaiki Submarine Cable, due to go live in June 2018, will be the fastest and largest link between the US and Australia and New Zealand. Tech giants are using more and more bandwidth. 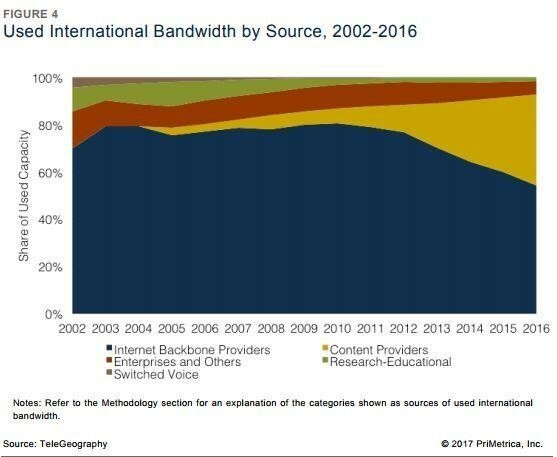 TeleGeography estimates that content providers now account for 38% of total worldwide used international bandwidth. Having their own dedicated cables means that they can use them as they like. “There are a handful of very, very influential content providers who are shifting the balance away from the telecoms,” Jon Hjembo, an analyst with telecommunications research and consultancy firm TeleGeography told Bloomberg. 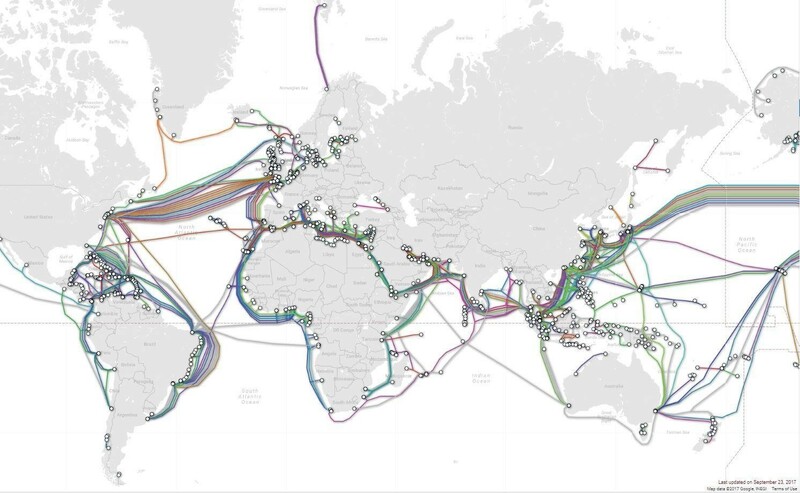 How does the internet cross the ocean? When we stream the latest TV series, or download high-resolution photos, we are probably unaware that the data behind them is speeding around the world in cables under the sea. In fact, 99% of data travels this way. Today, there are over 420 submarine cables in service, stretching over 700,000 miles (1.1 million km) around the world. It’s not a new phenomenon, though. The first transcontinental cable – laid in 1858 – ran from Ireland to Newfoundland, and made telegraph communication possible between England and Canada. Currently, the world’s highest-capacity undersea internet cable is a 5600-mile (9012-km) link between the US and Japan. Aptly named “FASTER”, the cable connects Oregon in the US with Japan and Taiwan. It’s owned by Google and a consortium of other communications companies. The demand for internet capacity is only going to increase in the next few years. There will be billions of consumer and industrial devices connected to the internet and ‘communicating’ with each other as part of the internet of things. Cisco estimates that consumer internet traffic will increase by 26% by 2020. Installing undersea cables requires specially designed ships which can lay between 100 and 150 km of cable per day. The fibre-optic cables are very fragile, so they are surrounded with layers of tubing and steel to prevent damage. This shark was filmed trying to bite a cable. It’s thought it was attracted to the electromagnetic pulses given off by the cable, as sharks also find prey that way. There are also more mundane threats to cables, such as accidental damage from construction projects or anchors dropped from boats. If a cable is damaged, divers are dispatched to assess the problem. The cable is then brought to the surface and fixed.